#18 Terriers are on the road this weekend for a pair of games vs. Maine. 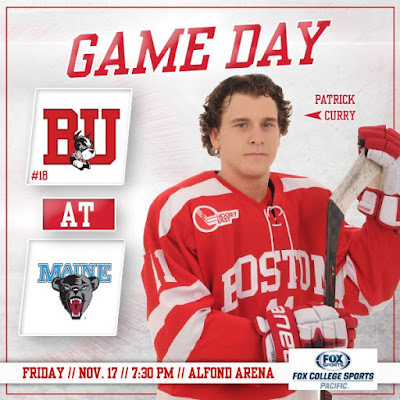 Tonight’s contest at Alfond Arena is a 7:30 p.m. start. It will air live on Fox College Sports-Pacific and be live-streamed on Maine All-Access.Tomorrow’s game will be played in Portland at the Cross Insurance Arena with puck drop at 7 p.m.
Maine, which was idle last weekend and most recently split a series at Lowell, will be looking for its first win against BU since a 7-3 victory at Fenway Park in January of 2014. Its offense is led by freshman Eduards Tralmaks, and sophomores Mitchell Fossier and Chase Pearson, all with seven points, and junior defenseman Rob Michel with six points. Junior Rob McGovern and freshman Jeremy Swayman have split the goaltending duties. BU’s last two weekends produced shutouts of Providence and New Hampshire and a pair of disappointing losses to Northeastern. The Terrier offense is paced by Patrick Harper with 11 points and Bobo Carpenter with 10. Jordan Greenway with goals in two of the past three games, Chad Krys and Brady Tkachuk all have eight points. BU will likely be without senior captain Brandon Hickey again this weekend due to a hand injury. Max Prawdzik is in goal again tonight. ►This week’s Hockey on Campus podcast features: Colorado College Coach Mike Haviland, last year’s Hobey Baker Award winner and current NJ Devils rookie Will Butcher and USA Hockey Director of Communications Dave Fisher. It airs on NHL Radio (SiriusXMChannel 91) on Saturday morning at 8 a.m. ET and Sunday morning at 10 a.m. ET. You can also find it here on College Hockey News. On NHL Central Scouting’s November 15 release of Players to Watch for the next draft, 2018 recruit Joel Farabee received an “A” rating, indicating a likely selection in the first round. Tyler Weiss received a "B" rating while Jake Wise, who has been sidelined from the NTDP U18s with a broken collar bone, received a “C’” rating. Hockey writer Jeff Cox, who wrote about players on the watch list from New York/New Jersey and New England, also offered his thoughts on why another NTDP U18 BU recruit, center Jack DeBoer, was overlooked on the November list. 2018 recruit Ryan O’Connell scored a goal and an assist in BCHL Penticton’s 7-1 win against Surrey. The 6’2” defenseman drafted by Toronto in the 7th round of the 2017 draft, has 11 points in 18 games for the Vees. Charlie McAvoy’s second goal of the season was a highlight reel tally in the Bruins’ 2-1 win against Los Angeles. Colin Wilson, who returned to the Colorado line-up a week ago, scored his first goal in the Avs’ 6-2 win against Washington. Terriers head to Vermont for a weekend series against the Catamounts. Friday’s game is a 7 p.m. start, while Saturday’s game begins at 4 p.m.